From soup to nuts, as they say. 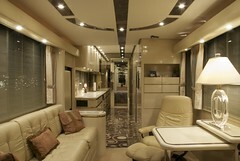 I can take your project from pre-production through final mixes. For budget conscience artists outside the metro Orlando area, you can stay on-site in a motor coach next to the studio. I’m always tracking drums for my productions and others. I’ve had other studio owners come in and track drums here. Don’t worry, I won’t tell. Actually, if you have your own small studio or recording set-up, drums present the greatest challenge. It takes a lot of microphones and pre amps to mic up a modern kit. I keep 5 kits ready to go, plenty of extra snares and cymbals, a wide selection of mics and plenty of experience recording them. Bring your own productions in for guitar overdubs or re-amping using my collection of amps and cabinets. Or, if you need a piano, record on a Steinway B.
I’ll mix or you can come in and mix. In stereo or 5.1. If in-the-box mixing is getting you down and limiting the sonic potential of your album, come in and see what mixing through an analog console can do. If you’re really adventurous, how about 2″ 16 or 24 analog? 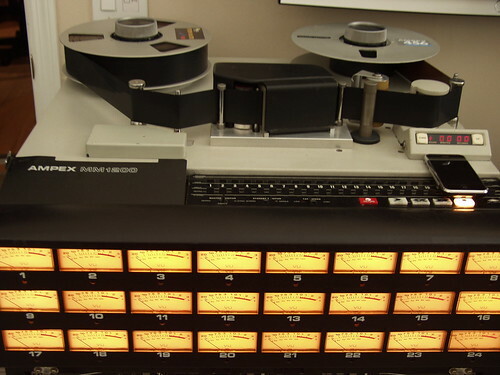 Have old 2″ master tapes falling apart in a closet somewhere? You’d better transfer them quick. 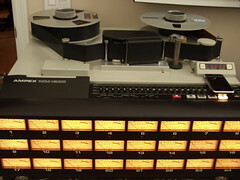 Come in and transfer those tapes on my Ampex MM-1200 2″ analog machine with both 16 and 24 track head stacks. OK, I haven’t had to go out on location for years, but occasionally a project comes along that’s worth yanking a ton of gear out of the studio for. I’ve recently mixed an exhibit for EPCOT and recorded music for a Cadillac spot on location. So, call me and let’s talk about it. I’ve been mixing for television and film for years and still mix several shows a year. I have all the necessary gear to lock to picture. Concert mixes for DVD release, documentary films, television pilots…I’ve mixed films that have aired on HBO, Cinemax, BBC, The Sundance Channel and many others.